An Attack On Players Forces Major Soccer Match In Argentina To Be Canceled — Twice The second leg of the final of the Copa Libertadores was billed as a glorious highlight in the tournament's history — the first ever meeting of age-old rivals Boca Juniors and River Plate. A River Plate fan sits on an empty stand at the Monumental Stadium in Buenos Aires, after the all-Argentine Copa Libertadores second leg final match against Boca Juniors was postponed on Sunday for the second time following an attack on the Boca team bus by River fans. Argentina has launched itself into a painful bout of soul-searching after attempting to host one of the world's classic soccer games this weekend and failing — twice. The second leg of the final of the Copa Libertadores was billed as a glorious highlight in the tournament's 58-year history — the first ever meeting of Buenos Aires' age-old rivals, Boca Juniors and River Plate. Yet the long-awaited "superclasico" was wrecked by an attack on players by fans, causing acute embarrassment to Argentina's government, and raising security concerns less than a week before the arrival of world leaders for a G20 summit in Buenos Aires, including Donald Trump. The game has dominated headlines in Argentina for weeks, generating public excitement and outshining the nation's long-running corruption scandals and economic woes, which have pushed inflation to 45 percent. Some 62,000 cheering and singing men, women and children arrived for the game Saturday, and spent much of the day in the stadium under a punishing sun before officials announced the game was off — some two hours after the scheduled kick-off. The postponement was caused by yet another incident of soccer violence — a problem that has long blighted the sport in South America and several years ago prompted Argentina to impose a ban on visiting "away" supporters. 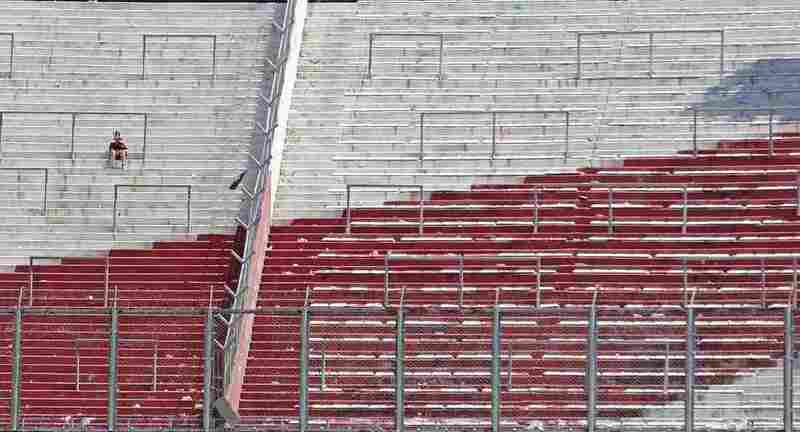 (This leg of the "superclasico" was to be played at River's Monumental stadium, in front of River fans only). Police security for the game was supposed to be tight, yet as Boca's team bus approached the stadium, fans within a crowd of River supporters pelted it with rocks and beer cans, smashing most of its windows along one side. Several Boca players suffered minor injuries, mostly caused by glass and tear gas, including the captain, Pablo Pérez, who was treated in hospital, and emerged with a bandage over one eye. The match was re-scheduled for Sunday, but as fans began to gather at the stadium again, there was another change of plan, delivering further disappointment to them, and to the vast worldwide TV audience. At around lunchtime, South America's soccer governing body, CONMEBOL, announced the 5 p.m. (local time) game would be rescheduled, without giving a date or venue. It did so after representatives from Boca argued that playing the game so soon after Saturday's attack would be unfair. "We don't want there to be any excuses that conditions were not equal for both teams," Alejandro Dominguez, CONMEBOL's president, said on TV. "We want both teams to have time to recover. "Soccer in Argentina is a rough business, long accustomed to dealing with scandal, organized crime and ferocious — sometimes deadly — disputes. Three years ago, a match between Boca and River was abandoned at half time after fans attacked River players with pepper spray. Yet, as they trudged home from the stadium this weekend, with their red and white River hats, flags and banners, fans seemed genuinely angry and sad. "This hurts me a lot," said Juan Angel Oviedo, 24, "because of everything that's happening in this country. Argentina is so rich [in resources], it should have much better security." "It's horrible, said Cristian Flores, 34. "Today is a disgrace to Argentinian football." Many directed their ire at Argentina's president, Mauricio Macri — a former president of Boca — and linked this fiasco with their overall frustration about the state of their country. Public anger was also reflected by a tsunami of criticism on social media, and by headlines published by many of Argentina's news organizations. "SHAMEFUL" said Diario Popular. The Peruvian sports tabloid El Bocón was harsher still: "IDIOTS". The lack of organization and security failure exposed by the "Superclasico's" postponement is raising questions about whether Argentina is adequately prepared for the two-day G20 summit of world leaders that begins Friday. The Argentine government's reportedly planning to deploy 22,000 police, and last week said it's cracking down on political activists who may be planning violent protests. Argentina's foreign minister, Jorge Faurie, sought to calm concerns Sunday, by declaring on TV, "We are prepared for the G20." "We have faith," he added. The same cannot be said of a multitude of soccer fans who wasted a weekend waiting for a game that never happened.